Cirrus clouds, wispy high-altitude threads of ice, are important components of the climate system. They regulate the amount of heat radiation emitted by Earth into space, so it makes sense to include cirrus clouds in global climate models. That requires a good understanding of how the clouds form. A new paper in PNAS finds that the previously thought mechanism for ice formation in humid but unsaturated (like those in which cirrus clouds form) doesn’t work. Instead, another mechanism better explains ice (and thus cloud) formation – and the details are far from foggy. In the atmosphere, ice forms on specks of dust and other materials in a process called nucleation. Researchers previously assumed that the nucleation process, when the air wasn’t humid enough to be saturated with water, occurred as water vapor molecules formed together directly into ice, with no liquid water step in between. But that explanation doesn’t fit with observations and molecular models, according to researchers from ETH Zürich, The University of Utah and the Zürich University of Applied Sciences. A clue to the true process comes from the fact that particles with pores – like mini-sponges – form ice particles with much higher efficiency than particles without pores. This led the research team to suspect that water vapor may condense in the tiny pores and that the ice crystals start growing from liquid water – not in vapor. 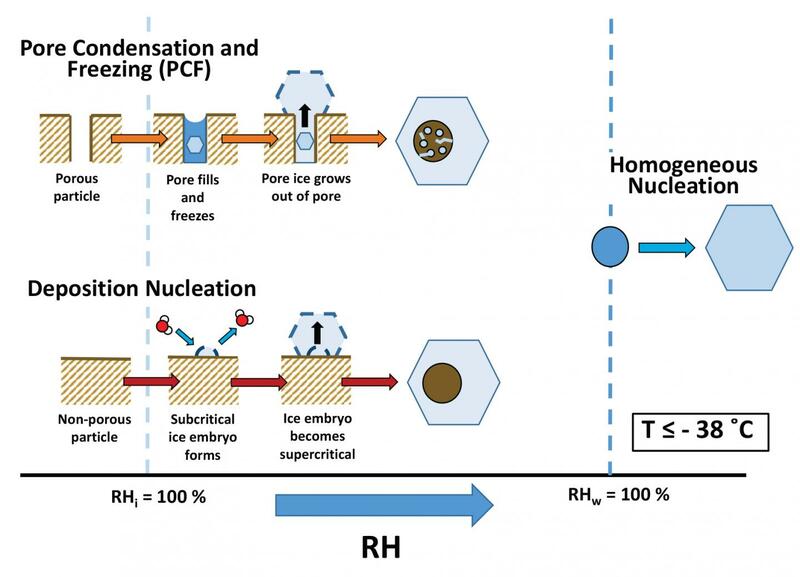 In experiments including molecular simulations and experiments with synthesized porous particles, the team concluded that their hypothesis was correct: Even when the air is not fully saturated with water, vapor can condense in small particle pores and help nucleate ice crystals. The process may be active in other cloud formation processes as well, the authors write, making the process called Pore Condensation and Freezing a newly important factor in understanding the formation of cold clouds and their impact on climate.